Updated Tuesday, Jan. 31, 2017, 1:13 a.m. EST: This was just too rich not to add. Here is CSPAN video from the Sally Q. Yates confirmation hearing as deputy attorney general. Notice who is asking her the question that would ultimately end her job. Updated Monday, Jan. 30, 2017, 9:50 p.m. EST: Donald Trump has fired acting U.S. Attorney General Sally Q. Yates after she directed Justice Department attorneys not to defend his executive order on immigration and refugees. This action comes on the heels of much pushback against the president’s controversial immigration ban that left thousands stuck at U.S. airports over the weekend and many family members distraught. According to ABC News, Defense Secretary James Mattis, Homeland Security Secretary John Kelly and Trump nominee to head the State Department Rex Tillerson have all told associates they were left in the dark about details of the directive until Trump signed it. On Saturday the ACLU asked a federal judge to intervene on behalf of two Iraqis detained at John F. Kennedy Airport. In an interview with Democracy Now’s Amy Goodman, Omar Jadawat of the ACLU said the ban is unconstitutional because the government cannot discriminate against a particular religion, and it can’t favor one religion, Christianity, over another religion, Islam. The ACLU says the legal battle will continue. As the Times notes, Yates’ directive is mostly symbolic because in all likelihood, Jeff Sessions will be confirmed as the new attorney general, but her move highlights the great divide between Trump and many of the government agencies he now oversees as president. Trump could elect to fire Yates, but she is the top Senate-confirmed official at the Justice Department, and the only one authorized to sign foreign-surveillance warrants, which is an essential function at the department. Yates was appointed deputy attorney general by former President Barack Obama, and she became acting attorney general when Loretta Lynch left the position. 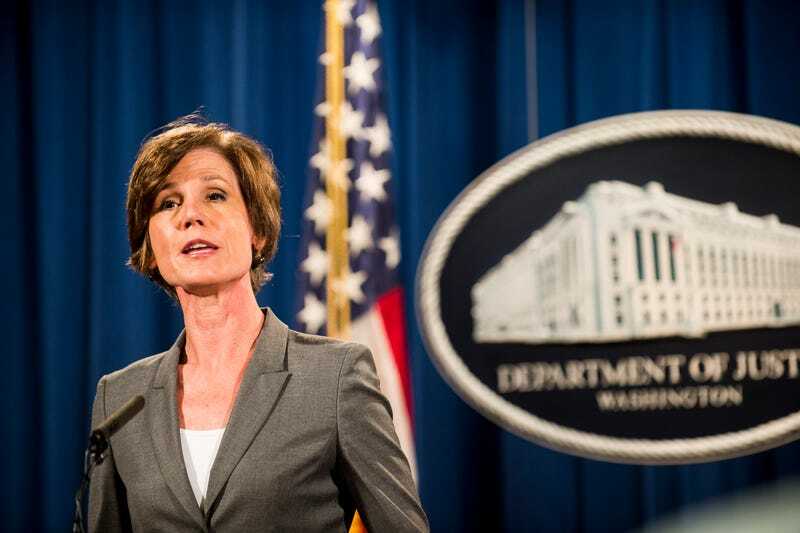 “For as long as I am the acting attorney general, the Department of Justice will not present arguments in defense of the executive order, unless and until I become convinced that it is appropriate to do so,” Yates wrote. Yates’ directive will remain in place until she leaves the department.